Depending on the time of year, most orders ship within 3 business days. Monogrammed orders may take a few days longer and orders placed near holidays may also take a few days longer. All orders ship via USPS. What do I do if I need to return or exchange an item? All custom/monogrammed items are not returnable, unless a mistake was made on our end. If you have an issue, please contact us ASAP so we can try to fix it. What style bow works best for each age? We have five styles of hair bows that work for babies up to tweens. Our Harper headband and Frances french clip are the largest and fit best for girls age 3+. 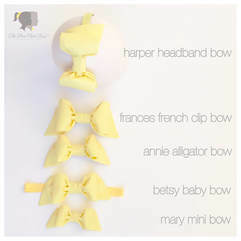 The Annie alligator bow has a large alligator clip and works best with hair that is not baby fine. The Mary mini bow has a tiny alligator clip and is perfect for fine hair and fly-a-ways. Lastly, the Betsy baby bow is on a 16" elastic headband and is perfect for babies - but make sure to keep it when they outgrow it so you can wrap it around her ponytail! Our Carter bow tie is adjustable and can fit a baby to a boy. How does the Beckham Belt work and what size should I get? Our patent-pending Beckham Belt is perfect for little ones that want to wear a belt but aren't quiet ready to work the buckle. Each belt has a fully-functional and fully-adjustable buckle plus a hidden military-grade velcro closure for easy access. ​Where are all your products made? We are so proud to let you know that all our bows, belts, and bags are handmade in the Dallas/Fort Worth area. We love supporting small businesses and keeping production local! 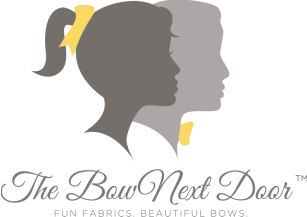 I'm interested in collaborating or hosting a trunk show featuring The Bow Next Door. How do I get in touch? We love collaborating with other brands and would love to work with you! Likewise, we would be honored to setup a trunk show at your business! Just contact us at hello@thebownextdoor.com and we'll talk! How do you fluff the bows? It's super simple! Below are two videos showing how to fluff your hair bows and your Basket Bow!